First, an unexpected exclusive shows up at Walmart. Now, one shows up at Toys Я Us. What are the odds that Target is sitting on something they haven't told us about, as well? Though Mary Jane may always know Peter Parker as the boy next door, to the rest of the world, he is better known by another name: Spider-Man. Okay, let's get him out of the way. 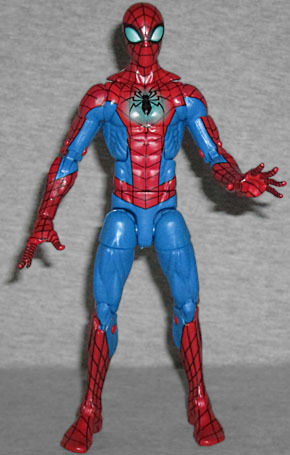 This Spider-Man, built on the body you'd expect, is wearing his current "All-New, All-Different" costume in the comics. How current? It debuted in issue #1 of a series that's just up to #27 as I write this. This certainly isn't the fastest a new design has made it to figure form, but this is still pretty quick, and it's the first incarnation of the new suit - no Minimates, POP!s or HeroClix have beaten it to the punch, yet. Designed by Alex Ross, this suit is only a minor change from the original. We've said it before and we'll say it again: there is no point in trying to "improve" Spider-Man's costume. You're not going to do it. The only improvement that could have been made to Steve Ditko's original design was to remove the webs from the armpits, and that was done decades ago! This one rates pretty high for sheer pointlessness, putting weird angles on the boots and gloves and adding a neon glow to the symbol on his chest. Yes, nothing says "timeless design" like neon. That's why we're all still dressing like Miami Vice today. Supposedly it's been filled with all sorts of technological advancements, but Spider-Man is not a "technological advancements" kind of hero - his Stealth Suit is the aberration, not the norm, because Spider-Man is a "cloth" kind of hero. It's nice that this is a costume that's never been a toy before, but it's still just dead weight in the set. Something that isn't, though? His head. Yes, the masked head is reused, but that's not what we mean. This set includes an unmasked Peter Parker head! There was a teen Peter in the last series, but this one is an adult. Since it just swaps out via a large balljoint, you can give this noggin to any figure that uses the appropriate body. So, you know, one with a good costume. Get a second, paint it yellow, and call it Ben Reilly. Anyway, even that takes second place behind the real draw of this set, Mary Jane Watson! Like the bio said, she was literally the girl next door, growing up next door to Peter and his Aunt May. She knew he was Spider-Man almost from the beginning, witnessing him crawling out of his bedroom window in costume one night, and kept the secret for years. When Gwen Stacy died, Peter drove everyone away from himself, but MJ refused to leave and was the rock that let him find his strength again. Eventually they were married, a union so good and right that Mephisto wanted to destroy it just to get one in the win column against God. And when that happened, it was only on the condition that she remember everything, because she refused to give him up. Get you a girl who can do both! 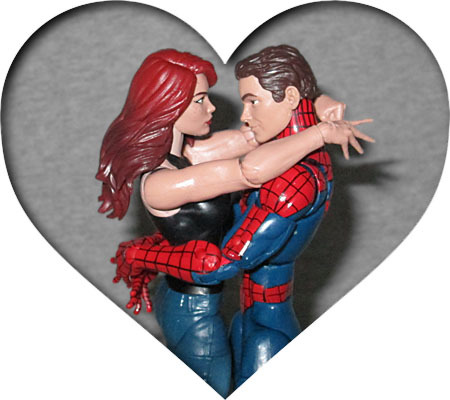 There have been 6" Mary Jane figures before, but they were both of the movie version of the character, never the comics. 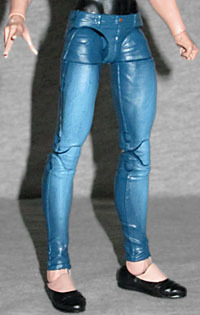 And while ToyBiz made a 616 MJ, that was in the 5" days. So this figure has been a long time coming! 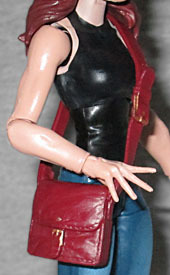 Mary Jane gets the arms and chest from Hasbro's female medium body, but the rest of her is new. They didn't have to do that - the Marvel Universe figure just painted on her details, after all - but this is much better. She's wearing plain black flats (which really should been painted with a strap running over the top of her foot), tight jeans, and a black sleeveless shirt - in other words, her "face it tiger" outfit. Her jeans are sculpted with seams, pockets and even small wrinkles, though if these are women's pants, shouldn't the fly be on the other side? The face was sculpted by Wide-Eyes McGee, but this time the factory painted the eyes in the right place, so she doesn't look weird. There are cute little freckles smattered across her nose and cheeks, and she has a face that deinitely looks like it could belong to a model/actress. We do wish they'd sculpted her with a big smile, rather than a neutral expression, but regardless, this is lovely work. Great attention was paid to the paint all over, not just the face. Her hair fades from a bright red to a darker shade as it gets lower, almost as if she'd dyed it and it's growing back out. Not sure what that's about, but okay. Her blue jeans are a lighter shade over her knees, as though they're wearing out. It's seriously amazing work, head to toe. She gets a fist and a gesturing hand, because there are only so many options available for this body, and she didn't need thwips. She even gets an accessory! It's nothing too wild, just a maroon purse, but that seems appropriate for her. If the strap seems too big for her body, that's only because this is a reused mold. Still works. Mary Jane Watson was not created to be Peter's perfect match - that's what Gwen Stacy was for. Rather, she matured into the role naturally, over time. In her earliest appearances, she was just a wild child, the girl who was into all those crazy things the kids like these days, like rock music and soda pop and fidget spinners. She was meant to be a contrast against the good, polite, obedient policeman's daughter, someone to flirt with before going back to Gwen. And yet. The fans liked her better, the creators liked her better, Peter liked her better... and so, like real people, they grew together. 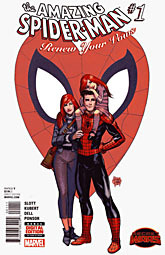 They grew so strong that even Marvel's efforts to split them apart haven't worked - Renew Your Vows, a comic that sees Peter and MJ married and raising their daughter, proved popular enough during Secret Wars that it became an ongoing after the crossover ended - and yet editorial doesn't take the hint. The Spider-Man in this set is hardly desirable, but he's at least unique, and you know you want a Mary Jane Parker Marvel Legend!